The olive is native to the Mediterranean region, tropical and central Asia and various parts of Africa. The olive has a history almost as long as that of Western civilization, it's development being one of civilized man's first accomplishments. The Little Ollie olive tree is also known as the Olea europaea and European Olive. 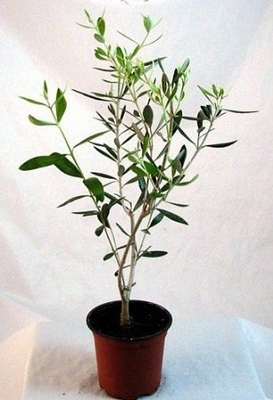 It is a visually striking tree with dark green leaves and produces little or no olives. In cooler regions makes a great patio/house plant. Fertilize in the early spring prior to new growth on the tree with a well-balanced tree food. Light requirement: full sun light Water : watering when dry Hardy in zones 8-11 The plant you will receive is growing in a 4" pot. It is 8-12" tall.